Although I don't wear a lot of makeup, I feel that eye shadow is essential for a glamorous evening look and had been wanting to get some for over a year but kept forgetting about it. I guess God was keeping a watch and my subconscious prayers were answered when the good folks at Luxola sent me a beautiful eye shadow palette which has loads of fabulous colors making it perfect for both day and night. Now that I had eye shadows, brushes were essential and I was lucky enough to find a wonderful set on Milanoo. For those of you who don't know, Luxola is the #1 Online Beauty Destination in Southeast Asia and stocks an array of cosmetics by acclaimed brands worldwide. The palette I got is by a German brand called Zoeva (which I had never heard of) but was delighted to read tons of rave reviews about it. This one's called Love is a Story and contains neutral and colorful shadows in a range of matte, iridescent and satin shades. The texture is silky and the colors have intense pigmentation. I've used it just once but absolutely loved the colors and staying power. The Love is a Story palette is really sleek and lightweight which makes it very travel friendly too. 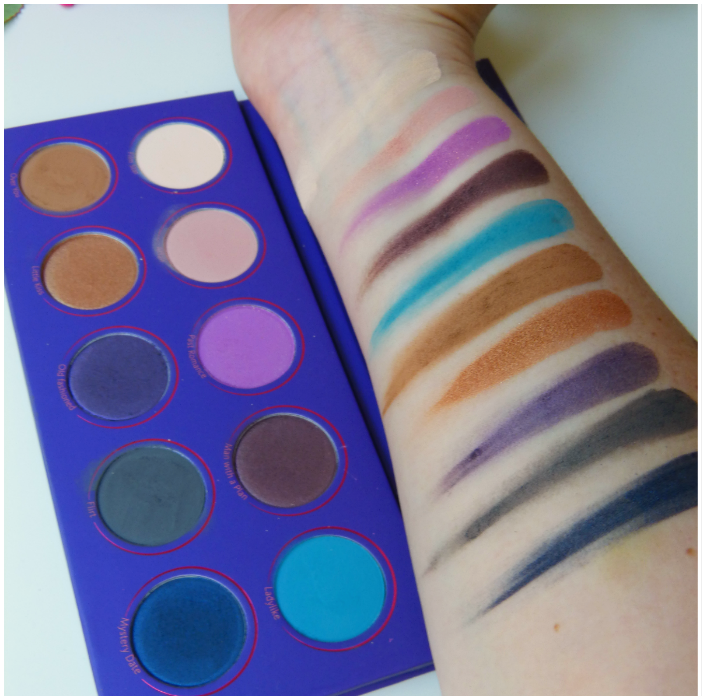 Its rated the best out of other Zoeva palettes and is really reasonable for the quality and quantity. Another bonus is that a couple of shades from it are MAC dupes too! Its definitely worth buying! You can check out all the rave reviews online if you don't believe me! Now, for great makeup, you need the right tools— and this arsenal of cute pink brushes is just perfect. These cute pink brushes are specifically designed for every part of the makeup process from eyes and cheeks to lips and brows. With the amount of makeup I wear, its safe to say that these brushes are going to last me this lifetime! This set is great quality all the brushes are really soft and have good quality bristles and the case is nice as well. Each brush is individually wrapped to ensure that they don't fray. Its also extremely cheap for the quality and quantity so you get great value for the price. Its definitely worth every penny! I love both products to bits and totally recommend you to get them too! The color and the packaging is awesome I will not mind trying it out. The brushes are so cute and the eye shadow palettes are super pretty. Very nice set you have there June :). The eyeshadow palette and brush set both look gorgeous! You lucky girl! Brushes are important to achieve a perfect makeup. Great review, I love the palette! A great range of strong colors! The brushes are awesome :-)! Those brushes are so cute!!! La paleta de sombras tiene un colorido precioso!!! I don't usually wear eyeshadow, but this palette looks so great. Also, those brushes seem amazing. I want both tools and eyeshadow:) lovely color to play with:). Pink brushes...I am in love. This palette have amazing colors! Lucky you! I really like the brushes set! I agree with you - I also don't wear a lot of makeup, but eyeshadows are so beautiful! I loved the ones you showed here (especially a light pink one), and the brushes are great! I have also big set of brushes, but I use maybe 3-4 of them. I love eyeshadow but I prefer natural and neutral tones like pale golds. Even when I go out, though I do adore a black smokey eye too. Gorgeous brushes! Very excited to get one of my own. The shadows have wonderful pigmentation and what an awesome brush set! links in my latest post. It would mean the world to me! These palettes are gorgeous! Thanks for sharing June! Omg I want these brushes! Wow... this brushes set is everything!!!!!! love Zoeva products! great review! I'm addicted to makeup brushes and these look really great. Amazing brushes set! Love all of products Zoeva! Nice post!